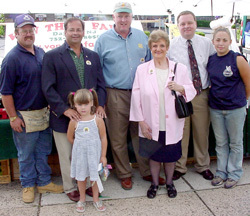 NJ Secretary of Agriculture Charles M. Kuperus visited the 3rd Annual Hasbrouck Heights Farmer's Market at The Boulevard and Washington Avenue on August 6, 2002 as part of National Farmers Market Week. 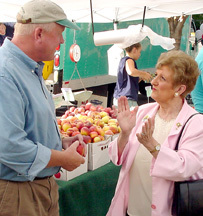 The Secretary carefully surveyed the fresh produce displays, sampled (and shared) peaches while providing informational comments. 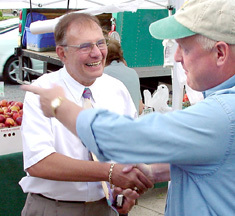 Mr. Kuperus met with farmers Bob Van Thun and George Asprocolas and discussed their family farm operations. 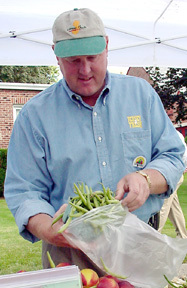 Bob Von Thun, 35, was named New Jersey Young Farmer of the Year in 2001. 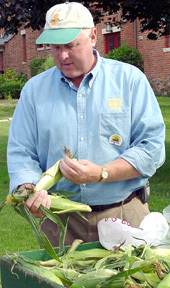 He farms 90 acres of his own land, which has been in his family since 1913, and an additional 60 acres that he leases. George Asprocolas of Millstone Township in Monmouth County, has been farming his 12 acres since 1992. 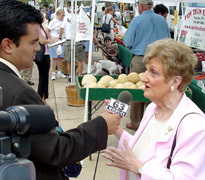 The Agriculture Secretary talked with Assemblywoman Rose Marie Heck, Mayor William J. Torre, Councilman Justin Di Pisa and Chamber President Tom Meli -- as well as members of the press and the public. 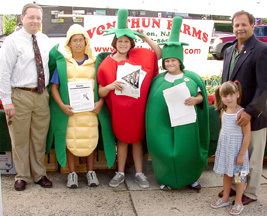 Three children dressed as a green pepper, a tomato and ear of corn distributed nutritional information about vegetables. 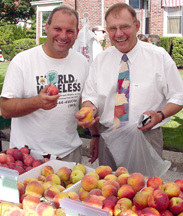 The August 6th Farmer's Market merchant co-sponsor was Andy Chermark and the World of Wireless, 361 Route 17 South, HH. 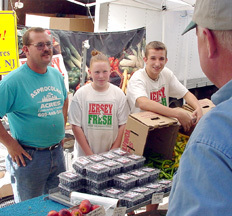 The HH Farmer's Market is sponsored by the Chamber of Commerce in association with the non-profit NJ Council of Farmers and Communities (NJCFC), the grassroots, not-for-profit organization that assists the municipalities that host these markets (with the aid and sponsorship of the New Jersey Department of Agricultures "Jersey Fresh" program and the U.S.Department of Agriculture), has insisted that everything sold at a Farmers Market be "Jersey Fresh" -- grown in, and by, New Jersey farmers. 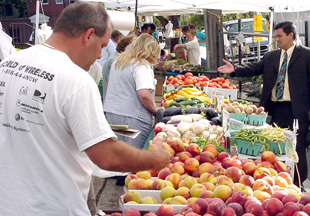 Other Bergen County Farmers Markets include: Englewood, River Vale, Teaneck, Ridgewood and Fair Lawn. 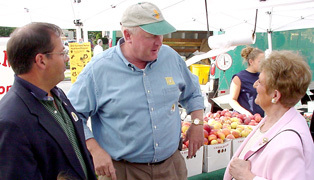 In 2000, more than 35 markets state-wide were open at least one day a week. 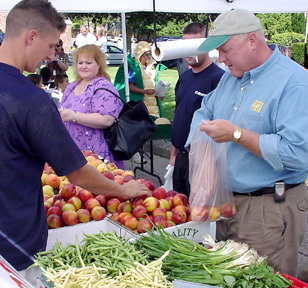 Such community-based programs give New Jersey farmers much-needed revenue, agriculture officials say. Farmland in New Jersey is steadily declining. In 1950 there were 26,900 farms in the state; in 1990, the last year for which comparable data were available, there were 8,100, according to the federal Department of Agriculture. 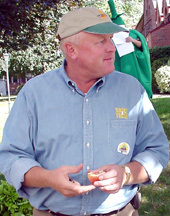 Farming in New Jersey directly employs about 18,000 people. 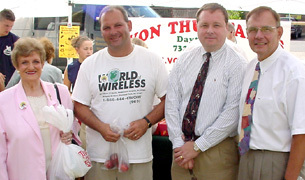 Farmer's Market co-sponsor was Andy Chermark of World of Wireless, 361 Route 17 South, HH. 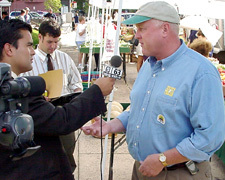 Mayor William J. Torre, talked with members of the press.